Woodblock prints are my speciality and I issue yearly catalogues devoted to this medium. I have written for major national publications on the topic, and lectured and served as a consultant I held the first catalogued retrospective of the prints of Margaret Patterson (1986) and curated the first museum exhibit devoted to printing matrices: "Provincetown Printing Blocks" (1988). GAN KOLSKI I am interested in (and collect) the works of the Polish-American artist, Gan Kolski (1899-1932). He did wood engravings as well as lithographs and etchings. I am interested in works by Kolski in any medium. CHARLES W. SMITH (Amer. 1893-1987) Smith did some wonderful modern woodblock prints and paintings. Prior to the late 1930’s he created more representational art but I am extremely interested in his abstract images. He was born in Richmond, Virginia and taught at Bennington College in Vermont in the late 1930’s and early 1940’s. He was head of the art department at the University of Virginia later in his career. I am less interested in his modern dog and bird prints which he did from the 1950’s. I am not interested in wood engravings from Harper's Weekly or other pictorial newspapers of the 19th century. Blockprinters didn't need elaborate printing equipment as etchers and lithographers did. They simply needed a block of wood, something to carve with, paper and ink. Therefore, many blockprinters labored alone and hence didn't not get "picked up" by standard biographical reference books. So, don't get too hung up on names or lack of an artist "being listed." There are many "unknown" artists who I will pay very strong prices for. 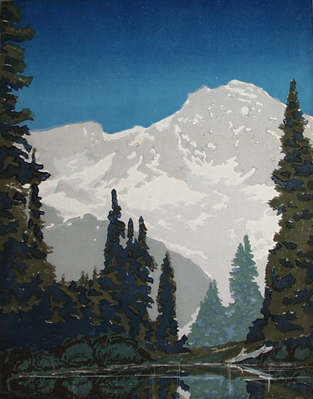 Just a few years ago the printmakers Ora Inge Maxim, W. Corwin Chase and Mary Burr Russel were "unknown" and today they bring very strong prices. I am interested in strong images by major or minor artists. Also looking for images with a good "Arts & Crafts" look (c. 1900-1935). I'm looking for c.1916 color postcards of New York CIty by Rachel Robinson Elmer.